Are you looking for a business that offers hardwood floor repair or wood floor refinishing service? Then you’re going to want to talk to the professionals at Archie Donoughe Sanding Co. We offer a variety of services in the Buffalo, NY area. From wood floor installation and hardwood floor repair to hardwood floor refinishing and more, we are the company to trust. Hardwood flooring adds a touch of elegance to any home. It's important to keep your wood flooring in good condition, or else it can look dingy and old. Keep your floors looking like new with hardwood floor refinishing and repair services from Archie Donoughe Sanding Co. With decades of experience serving the Buffalo, NY area, there's no better company to call when you need hardwood floor service. 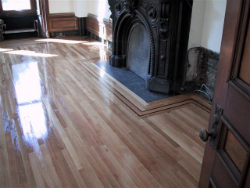 Archie Donoughe Sanding Co. staffs experienced hardwood floor installers and refinishers in the Buffalo, NY area. It is in our best interest to always provide top-quality work at reasonably low prices. We are located at 163 Robinson Street in North Tonawanda, NY. If you need hardwood floor resurfacing, installation, or repair work, we are the company to trust. Stop on by or give us a call today at (716) 692-8416. Offering Wood Floor Installation, Refinishing and More! Archie Donoughe Sanding Co. is family-owned-and-operated and has served Buffalo, NY and the surrounding Western New York area since 1971. We specialize in supplying the most superior services, including hardwood floor repair, resurfacing, and installation for both residential and commercial customers. When it comes to excellent, high-quality hardwood floor refinishing, hardwood repairs, sanding, floor resurfacing and striping, you can count on us! At Archie Donoughe Sanding Co Inc., we offer Action Floor Systems, an excellent resource for both hardwood and synthetic flooring. For more information on all of our flooring and services provided, please feel free to browse our website. If you have a question about what wood floor will work best for you, or about our wood floor installation, hardwood floor repair, wood floor refinishing, hardwood floor replacement and other services, call us today at (716) 692-8416. If you’re looking to replace your old, dirty tile floors with gorgeous hardwood floors, enlist our expertise. We can help you choose the perfect type of hardwood floors that suit your existing décor, or your new and improved décor. We won’t start installing your new floors until you’re ready for us to start. Once you’re ready, we will then get to work on our hardwood floor replacement services. Rest assured, we’ll try to cause few-to-no interruptions to your daily routine and we’ll leave no mess behind. We care about you and your family’s safety and convenience. You can trust our hardworking crew to install your new floors in a timely manner, so you can start enjoying them that much sooner. 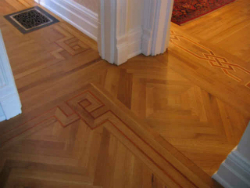 We offer the most prompt, error-free hardwood floor replacement services in the Buffalo, NY area. Stop in or Call for Wood Floor Refinishing, Repair, and Other Services! For hardwood floor refinishing and installation, gymnasium floor installation, wood floor repair, and more, give Archie Donoughe Sanding Co. a call. 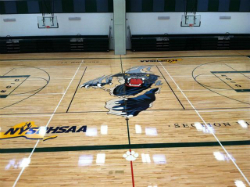 It’s best to remember our name when you’re ready to update your home with new wooden floors, install a new gymnasium floor in your school, or repair your existing hardwood floors in your restaurant or office. For your residential and commercial wood floor installation, wood floor refinishing, and hardwood floor repair needs, we at Archie Donoughe Sanding Co. have you covered. We are the leading provider of hardwood floor repair, installation, refinishing, and more. Looking to add a gymnasium floor? We are the company to call for professional installation services. Give us a call today! We look forward to serving you and the rest of the Buffalo, NY area!